Qt is supplied with a variety of examples that cover almost every aspect of development. They are not all designed to be impressive when you run them, but their source code is carefully written to show good Qt programming practices. You can launch any of these programs from the Examples and Demos Launcher application. These examples are ordered by functional area, but many examples often use features from many parts of Qt to highlight one area in particular. If you are new to Qt, you should probably start by going through the Tutorials before you have a look at the Application example. In addition to the examples and the tutorial, Qt includes a selection of demos that deliberately show off Qt's features. You might want to look at these as well. 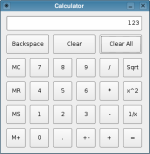 Qt comes with a large range of standard widgets that users of modern applications have come to expect. You can also develop your own custom widgets and controls, and use them alongside standard widgets. 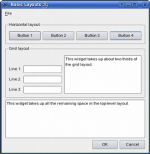 It is even possible to provide custom styles and themes for widgets that can be used to change the appearance of standard widgets and appropriately written custom widgets. Qt includes standard dialogs for many common operations, such as file selection, printing, and color selection. Custom dialogs can also be created for specialized modal or modeless interactions with users. 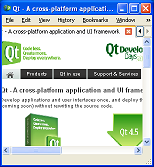 All the standard features of application main windows are provided by Qt. Main windows can have pull down menus, tool bars, and dock windows. These separate forms of user input are unified in an integrated action system that also supports keyboard shortcuts and accelerator keys in menu items. Qt uses a layout-based approach to widget management. 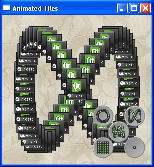 Widgets are arranged in the optimal positions in windows based on simple layout rules, leading to a consistent look and feel. Custom layouts can be used to provide more control over the positions and sizes of child widgets. Item views are widgets that typically display data sets. Qt 4's model/view framework lets you handle large data sets by separating the underlying data from the way it is represented to the user, and provides support for customized rendering through the use of delegates. Qt is provided with a comprehensive canvas through the GraphicsView classes. 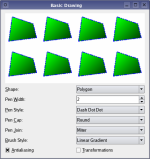 Qt's painting system is able to render vector graphics, images, and outline font-based text with sub-pixel accuracy accuracy using anti-aliasing to improve rendering quality. Qt provides features to enable applications to integrate with the user's preferred desktop environment. Features such as system tray icons, access to the desktop widget, and support for desktop services can be used to improve the appearance of applications and take advantage of underlying desktop facilities. Qt supports native drag and drop on all platforms via an extensible MIME-based system that enables applications to send data to each other in the most appropriate formats. 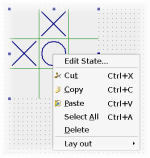 Drag and drop can also be implemented for internal use by applications. Qt 4 makes it easier than ever to write multithreaded applications. More classes have been made usable from non-GUI threads, and the signals and slots mechanism can now be used to communicate between threads. The QtConcurrent namespace includes a collection of classes and functions for straightforward concurrent programming. Qt is equipped with a range of capable tool classes, from containers and iterators to classes for string handling and manipulation. Other classes provide application infrastructure support, handling plugin loading and managing configuration files. Qt provides support for integration with OpenGL implementations on all platforms, giving developers the opportunity to display hardware accelerated 3D graphics alongside a more conventional user interface. Qt provides low-level audio support on linux,windows and mac platforms by default and an audio plugin API to allow developers to implement there own audio support for custom devices and platforms. The Phonon Multimedia Framework brings multimedia support to Qt applications. The XQuery/XPath and XML Schema engines in the QtXmlPatterns modules provide classes for querying XML files and custom data models. Internationalization is a core feature of Qt. Qt is provided with a powerful embedded scripting environment through the QtScript classes. Qt provides an integrated Web browser component based on WebKit, the popular open source browser engine. Support for interactive help is provided by the Qt Assistant application. Developers can take advantages of the facilities it offers to display specially-prepared documentation to users of their applications. Qt provides a powerful hierarchical finite state machine through the Qt State Machine classes. These examples show to to use the animation framework to build highly animated, high-performance GUIs. Applications can be written to respond to gestures as a natural input method. These examples show how to enable support for standard and custom gestures in applications. D-Bus is an inter-process communication protocol for Unix/Linux systems. These examples demonstrate how to write application that communicate with each other. Systems with limited resources, specialized hardware, and small screens require special attention. These examples demonstrate how to write ActiveX controls and control servers with Qt, and how to use ActiveX controls and COM objects in a Qt application. One more valuable source for examples and explanations of Qt features is the archive of the Qt Quarterly.